BBC NEWS | UK | Magazine | What is the point of executive producers? What is the point of executive producers? Ant and Dec's executive producer status is "a vanity credit"
ITV boss Michael Grade has described the executive producer status of Ant and Dec on a Saturday evening show as merely "a vanity credit". So what does the job title mean? 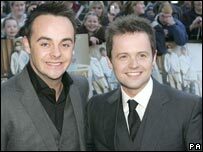 A show fronted by Ant McPartlin and Declan Donnelly is among those implicated in the ITV phone-in investigation. Saturday Night Takeaway was one of several named for rigging competition winners in an audit ordered by the channel. The pair, who not only present the show but are credited as "executive producers", have said they had "no idea" problems existed and they had been "disappointed to discover that these irregularities have occurred". The channel's chairman has called their production role "kind of a vanity credit". Despite executive producers being regarded as major movers and shakers in the TV and entertainment world, definitions of the role are hard to pin down. The title can be conferred on a celebrity or "talent" who has given their name to a project to boost its prestige or credibility. It can also go to the show's creative dynamo - who might be a writer or originator of the programme idea. Ant and Dec are not the only primetime stars to have added the title to their list of accomplishments. Music mogul Simon Cowell is executive producer of reality series Celebrity Duets and comedian Eddie Izzard notches up the credit on US TV drama The Riches. The degree of power and influence executive producers wield varies enormously, with some more hands-on than others. A producer deals with the "nuts and bolts", says Broadcast Magazine's Robin Parker, "overseeing edits, booking guests, and making sure everything goes according to plan". Their executive counterpart is "usually behind the idea, the vision that has enabled the programme to be made". They tend to have an overarching creative or business role - so they could be responsible for anything from handling business and legal issues to attracting investors or guiding the progress of a storyline over a season. Some TV shows will have several executive producers, comprising production executives, financiers and writers. "The title is often awarded when you have 'talents' that are very closely involved with the direction of the programme. "For example celebrity chefs who have their own production companies quite often take the credit. [Others] might get the title as a reward for bringing in a talent or negotiating a deal." It can be a vanity title, concedes, Mr Parker, but "it also recognises the overarching concepts behind a programme". Robin Mahoney, of independent film and production company Mensch, says: "An executive producer is the person who generally brings the concept to the commissioners, has the contacts, sets up deals, makes sure finance is there and so on, but doesn't have a hand in the day-to-day running. "They are ultimately being a figurehead for the programme, so the buck should stop with them. "But the names and credits given to people in TV are often so wishy-washy that you could argue they are meaningless and just there to massage egos." The legal responsibilities of the title are "as long as a piece of string," says Cameron Doley, managing partner at leading media law firm Carter-Ruck. "It's not like an editor of a newspaper who has legal responsibility and can be sued for what is in there. The title itself doesn't bring any legal responsibilities, it is the action." "If it's just a vanity thing and they don't have any real or causal role in what happens, they have not caused what happened and therefore their liability would be illusory; would not exist." Richard Wade is a former editor of the BBC's Tomorrow's World who has also worked as an executive producer for the programme. He says that in the latter role he still had "total responsibility" for the output and adds that someone with a credit as a producer of whatever kind may be held legally responsible if the programme runs into problems. But he also observes: "Somebody else is going to have to show that the title was one of genuine responsibility because in the end, titles do not mean a thing."